WaterSystems Cleaning (WSC) has serviced and cleaned fume scrubbers, cooling towers, air stripper towers and other industrial equipment in since 1986 without a time-loss injury. Our record of zero accidents in thirty years is no accident. 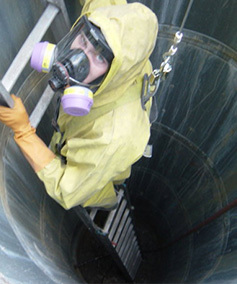 WSC technicians understand how to perform tasks thoroughly and safely. But most importantly, our safety program works because WSC technicians believe in safety. Recently our technicians were recognized by Applied Materials for Outstanding Safety Performance during their equipment maintenance shutdown. The plaque is proudly displayed at our office as a reminder that we are serious about safety. A Senior Safety Engineer reviews our written CSE Program, Respiratory Program, safety equipment and technicians annually. This is done so we may pass vigorous reviews by our customers. All Company safety programs have been found compliant with both Cal/OSHA and Fed/OSHA regulations. Monthly, our technicians attend safety meetings covering a broad range of safety issues from lifting to fall protection. Each day, our technicians complete a safety walk-around and tailgate meeting before starting a project. Annually, we have an all day safety conference covering Hazard Communications and other safety issues faced by technicians in the field. Rescue Consultants developed our rescue procedures. Finally, our Company’s experience in servicing the fume scrubbers and cooling towers enable us to work more safely around your company than any other service contractor. Our accident free safety record saves us insurance dollars that we pass on to our customers. Contact us today and let us show you how working safely can save you money.